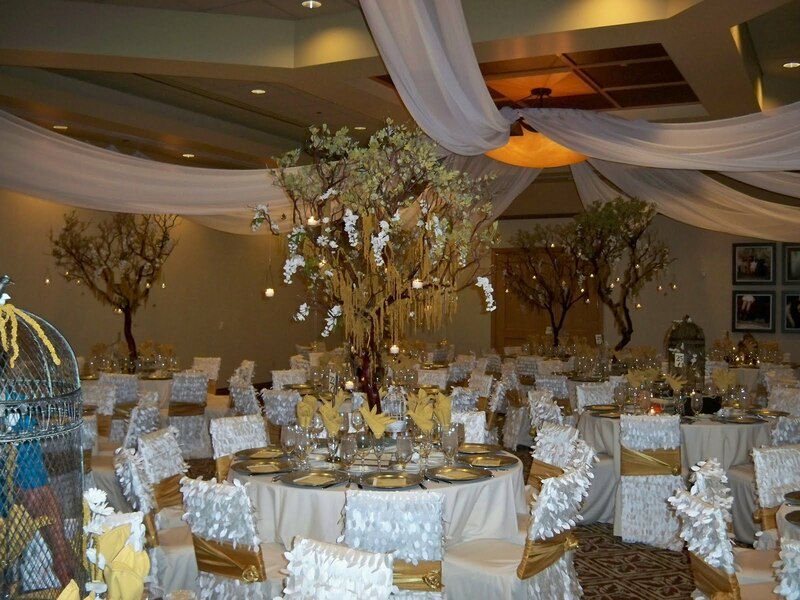 My grandson was married last Friday and I just had to show you the beautiful decorations for the reception. They made all the chair covers and did all of the table decor. I got a sneak peek before the ceremony. I thought everything was stunning. Sorry for the sun glare. Her dress was designed to completely cover her wheelchair, and it was exquisite. Every inch is covered with gorgeous lace rosettes. Being introduced as Mr. and Mrs.
My son, (father of the groom). As a single dad, he raised a very special young man. The bride's parents and my son giving a toast. I love all the thrifted frames they used for the backdrop for the head table, and their initials. My precious grandson and my special new granddaughter. Thanks for letting me share. I'm such a proud grandma. Congrats Marty! What a beautiful couple and wedding as well. wonderful. What a beautiful family! Wow, the wedding was gorgeous!! Congrats to the beautiful couple! Hi Marty, Congrats to your grandson and his new bride. Love the empty frames on the wall and the ruffles on the chairs. Everything was gorgeous! Marty! You should be proud. Wow I'm blown away that they made all those chair covers!! Wowzers. Oh Marty, how lovely! Wishing the bride and groom a lifetime of sweet moments! What gorgeous decor! They did an oustanding job, you must be very proud! What a beautiful wedding, you must be a very proud Grandma! Absolutely gorgeous decorations - the frames/letters and chair covers must be unique. Proud grandma. 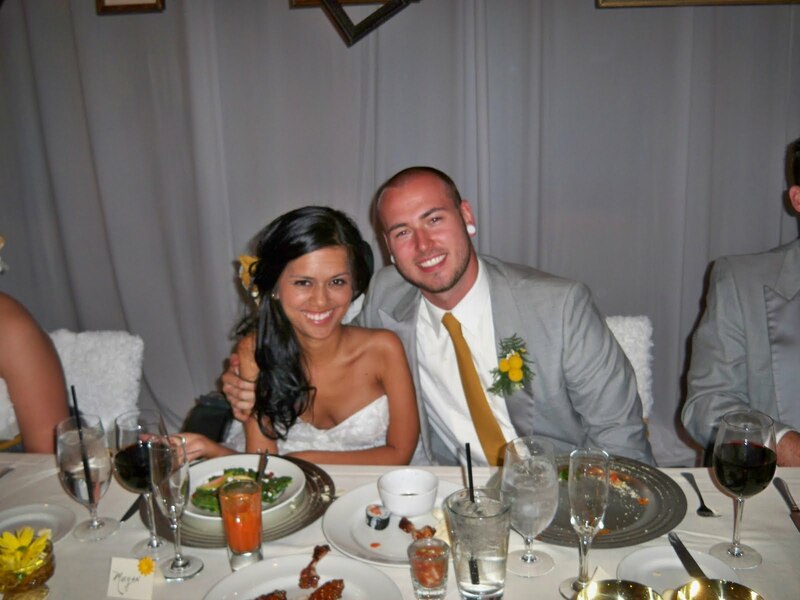 Beautiful wedding and reception photos. Thanks for sharing new family history at its beginning. Hi lovely lady. This was a truly Beautiiful Wedding sweet lady. Thanks so much for sharing your lovely family with me ~~And you must be so proud to be a Grandma !! OH My goodness "THEY" are absolutely gorgeous,the wedding is so beautiful,and your son the father of the groom is soo good lookin.I can see the happiness everywhere. What a Lovely Couple!!! Beautiful reception area! I wish them the best! 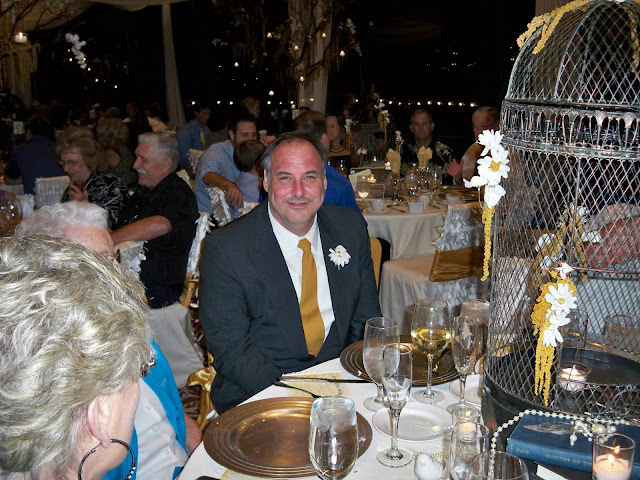 Thanks for sharing those wonderful pictures of your grandson's wedding and reception, Marty. It looks like a lot of love and DIYing went on to make it such a lovely event. Perfection! Down to the last tiny detail .... I am bubbling over with happiness for each of you. Looks like it was a wonderful reception and all the smiles were precious. How beautiful!! The decor and the happy couple! Congratulations to you all! Breathtaking! Congrats to the Groom and Best Wishes to the Bride! Congratulations to the newly weds!! Everything is so pretty - thanks for sharing their special time. Thanks so much for sharing, and congratulations to them both! Oh, Marty, what a beautiful couple! Ii wish the all the best! Everything is gorgeous! Look at the chair covers and they look like little evening gowns! You have every right to be proud! Marty, what a beautiful couple they are! And what a beautiful reception! Marty lets pow wow over those frames in the background!!! True Love is always beautiful and it surely shows in every photo you posted.. Thank you for sharing this lovely occasion with us Marty.. I just loved seeing these pics! They did a fabulous job, it looks like a royal wedding it so pretty! And they make such a lovely couple too! 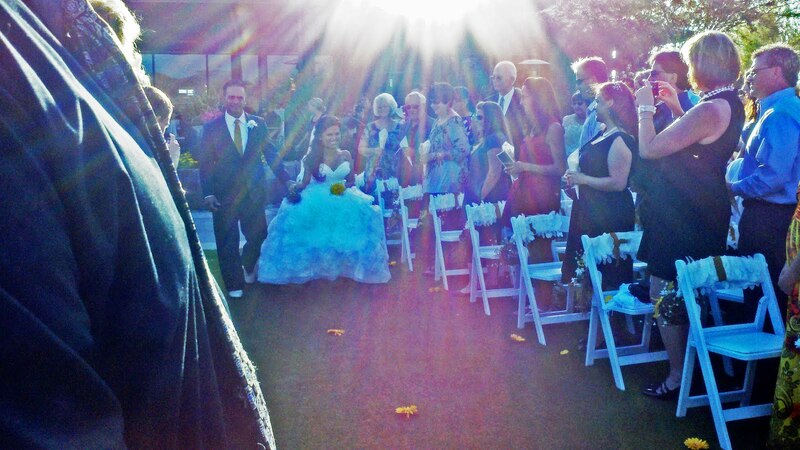 Those are some gorgeous wedding photos...your sunflare is artistic...and wonderful!!! Marty, what wonderful photographs of a perfect wedding! The bride and groom are just beautiful and look so happy! Thanks for sharing. 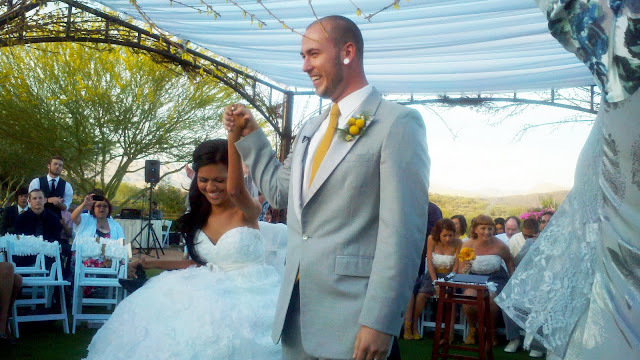 Beautiful wedding and beautiful couple..
You deserve to be a proud grandma, Marty, as well as a proud mom. Your son sounds like a great man, and it's obvious he's raised a very special son. Your grandson and his new wife are a beautiful couple! I pray that she will be healed and that they can have a long and wonderful life together. Looks like it was a beautiful wedding! I just love those frames too. What a great idea. They are a great looking couple! Congratulations. What a gorgeous gown and what a beautiful couple. The decorations look awesome. Congratulations! They had such great ideas for the reception decor. I love going to a wedding where you can see the bride and groom's personality in the decor. Wow! That certainly was special. You had me at the title and thumbnail. I love wedding shots. Everything was just plain stunning to me. I loved the colors and all the decorations, especially the tables and centerpieces. And the happy bride and groom are a gorgeous couple. What a beautiful couple and a handsome son you have, Marty! The decor is so pretty and so unusual. Love the frames and initials and how did they make the chair covers? So pretty --- all of it! Very cute couple. Wow, did they decorate for a week! Love the frame idea. It's O.K. to be a proud Grandma! It appears you have every reason to be proud of the beautiful couple. What wonderful and clever decor for the reception...that was a lot of work with great results. The decor is gorgeous! They did a great job. Congrats on the new addition to the family!! What a beautiful new granddaughter you have! They look so very happy...congrats and many wishes to them both! 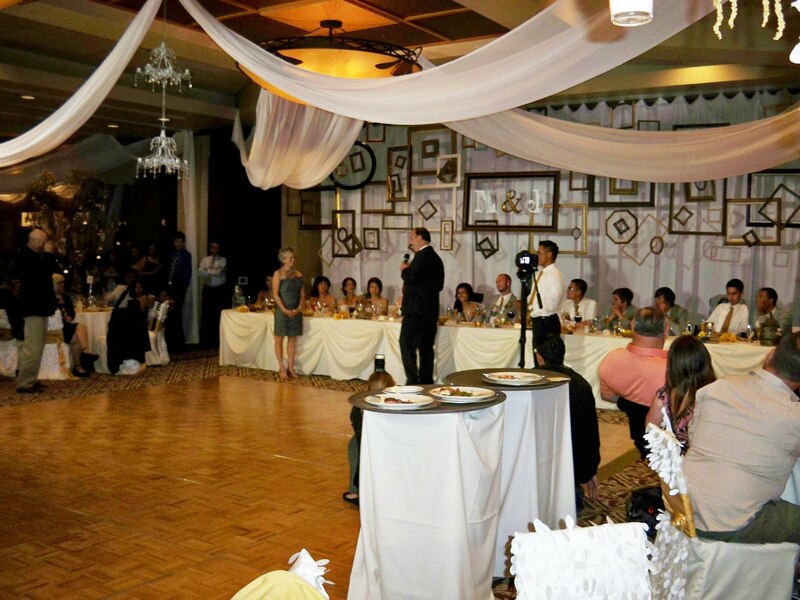 I also want to say that I've had my own wedding coordinator business for many years and they have done a phenomenal job on the design of the reception. What great talent! Kudos to them! Looks like you have gotten a very talented granddaughter; the decorations at the reception were stunning! Such a handsome couple! You have every right to be proud! Looks like a beautiful wedding and reception. Love those frames and their initials!! What a beautiful wedding!!! THey are a beautiful couple!! I love all of the frames!!! Congratulations. It looks like a magnificent occasion. I can't believe they made all of that themselves. Just spectacular. A big congratulations, Marty! Your grandkids make a beautiful couple! Somebody very creative was in charge! What beautiful decor. What a nice family you have, Marty. The couple looks happy and the Daddy proud! What unique ideas for the decor at the reception-but all of that pales in comparison to the beautiful wedding couple. Marty what a beautiful family you have!! I know you were so blessed to get to spend this speceial time Together!! Pray bride and groom will have a beautiful life together! Hey where is you in your dress. Excited to see what you found to wear! those are beautiful decorations!! And I love (not like) love the chair covers!!! Oh my goodness Marty! Let me first begin by saying that they are a beautiful couple & I hope they have a lifetime of happiness together! They did an amazing job with the decor...it's stunning! Congratulations to this very special couple. I remember you testifying about your grandson. He is very cute. You have reason to be proud! What a gorgeous couple. There is a special place in Heaven for each of them.